I don't use a tripod that much, well, relative to how many pictures I make. About 15-20 of the ones I have posted here were done with a tripod. I don't use one more often for a few reasons. First, I have been focusing a lot on trying to make pictures of people using strobes. Using a tripod under those circumstances doesn't make sense to me. Pictures are sharp enough. Another reason is my tripod is not the easiest to work with. 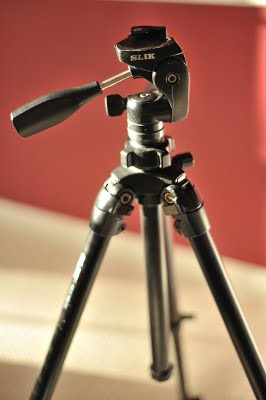 I think its a great tripod for what I initially bought it for. It was inexpensive, heavy, and pretty stable. I've used it in rain, mud, cold, heat, etc. It does the job. The main drawback is it has a pan-tilt head, which are slow to work with for still photography. It also doesn't extend enough without the center column for me to use standing up. That isn't too much of a concern because I find standing up is rarely the best position to make a picture from. Last year I looked into getting a second tripod to use for nature photography. I wanted a light tripod to carry, a decent ballhead for speed of use, and I wanted to be able to use it at standing height if needed. My quick research showed that to really improve upon what I already had would be prohibitively expensive. I just didn't care about nature photography that much, and my primary photographic objectives don't require a tripod beyond what I already own. A tripod of that quality and expense would be overkill, so I stopped thinking about it. However, my research didn't go far enough. I recently stumbled across a tripod manufacturer named Feisol that may fit my wants at a cost I can stomach. I have been looking into ballheads to put on them if I decide to buy. Feisol makes one that seems decent, and I recently found another ballhead manufacturer named Photo Clam. The latter seem to cost more, but still much less than the "big boys" from Really Right Stuff, Markins, etc. Don't get me wrong, if nature photography were my primary bent I'd pony up for a top-notch rig. But its not. For me even getting 80% of the performance of those high end setups is probably overkill, so saving 40-50% of the cost is a no-brainer, especially with the level of performance that is reported on the net. Although, Feisol has attracted fan-boys, so some of that maybe hyperbole. However, I still need to decide to get one or not. It is still pricey enough to give me pause.